What about increasing the amount of recharge coupons for recharging driller boys, maybe same recharge cost as sprints? Since people are mostly complaining about others who tend to have multiple driller accounts, this would greatly reduce that. This way there would also be less galders to go around which will make them more valuable again. Not really considering that you get loads of galders from driller boy, it should pay it off. People wouldn't just earn tons of galders w/o spending much for 1 recharge. Hello !! here are some suggestions for the next patch ... And before someone comments are personal opinions ok? Thx for all!! JP Stones (crystal) sold in My Shop ... Why it is hard to find the ones we want and when we do, not always compounds are good, so becomes unfair only a few players make much better items, and if these stones are not more tradable, this itens will become items impossible to be catch up, I suggest most expensive price rather than the usual stones of Myshop, i suggest between 6k ~10k. Equal wings of pets, I know there is a competition now, but not always the wings there is a lot to do with the look, and some pets have fantastic wings and a very beautiful effect as kokami and fairy petite. Gvg tournament (idea of ​​Dannyx1) And i think this is a nice idea, because the guild leaders can organize directly much better the players than openly, and pvp needs action to move the game. Increase respawn in some mines. For example the Techichi is slower than the tap. Of course for a char have time enough to do the quest, i do in less than one minute sometimes, but if you count as ever seen 2 times, low level chars with party full and another person who wants to do the quest to same time, you can not ... And who loses out is who really needs leveling. Swamp also need, though it is more respawn by number of chars in the mine in same time. 6 suggestion: List of eggs shop largest. Why I do not see many interesting items there to sincerely exchange. Thx for read, and im sorry for the bad english. i suggest between 6k ~10k. 6 suggestion: List of eggs largest shop. Sadly, if we make any new pets, then they lose their animation. Adding wings would be like adding new pets (as we would have to change the file), so it is impossible (as of right now) to add such a feature, unfortunately. We may be able to do this. The problem with changing respawn rates is that it affects the whole game greatly, and can break the game. You never know, though-- maybe we can change it. It's been a while since we did do an Egg Shop update. Maybe we can swap 'em out. Thanks for your suggestions! All suggestions are always appreciated. 1- Im not rich (at all) for sure, but is not fair jp stones in same price of normal stones in my shop. 4- No im in mines a lot, many times... and with 1 another char afk, everytime when im back in techichi i have to wait respawn like: 1 time kill 8(dont need wait), another kill 8(dont need wait) and it is the time i spending low time, another kill 2 and wait respawn, later kill 4 wait respawn, later kill 6 wait respawn and back 8 and 8. But in Tap everytime i receive total total to make the PQ, and spending same time, im sure this have a explication, but anyway sometimes mine is full and some players respect who cames first or who need up, and sometimes no. 2- ok is a idea only for a minimum two partys can participate without fight. 3- its be great *-*. Like a say is just suggestions... im sorry for the bad english again. Ohh! Yes, I did misunderstand you. I thought you meant you wanted to put wings on pets, and asnoobasme's response made me think that too. Maybe we could, though, that's a good idea. I'll sit down and make a few sometime! 1) i would like to suggest neutral CF. Well, it's a CF that has no level so you can use it on any item. 3 of each for 400ms points on MS, so players who are in need of a specific CF can use this to replace. Those CFs only work through website. 3) Only hunt poppuri event: no more zombies, make a full 1 mounth hunt poppuri event with goals, everyone wins, everyone plays, everyone must have min. of 200 hunt. 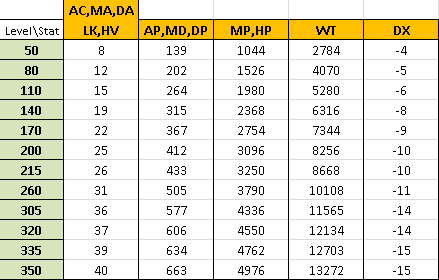 (there doesnt seem to be fixed amount of stat per level, so i didnt do missing levels; they probably dont exist yet, because there is no option for them in web compound) All numbers are max values only (who cares for mins ), no elixirs applied. Will names of [JP] compounding stones stay the way they are now? Joking aside, I agree on this completely. I would like to suggest a NPC like Poppuri in Event garden, where you can exchange [JP] Stones you do not need, for the once you are seeking for. Example: You trade 3 [JP] Shock crytal 50 for a 260 or so. As It works with the elixirs, but this time for [JP] Compounding stones. That's not a bad idea, in my opinion. But if it were to ever be added, it wouldn't be 50s -> 260s. Probably [JP] Type1 260s -> [JP] Type2 260s. Still talking about npc... What about a item girl selling potions in colosseum waiting room? Hello I would like to do a quick Bug report, and a warning to all players. The move Tornadoe Bomb, when used by a guardian, on the pig boss Koiosu will sometimes lift him off his pedal-stool. (He becomes frozen.) When this happens he cant attack you but he can still warp you. The circle will be invisible. *But the worst part is you will NOT SEE WHAT IS DROPPED NOR CAN YOU PICK IT UP because his body doesn't leave* So don't use the skill Tarnadoe Bomb! Aran is finalising April item list for maintenance. Reserve all your other suggestions for May.